Tri-Village’s Maddie Downing crushes the ball back toward the Twin Valley South side of the net during a match at the Panthers home last Thursday. The Patriots won the match in three straight sets. Tri-Village’s Maria Petry smashes the ball back toward the Twin Valley South side of the net during a match at the Panthers home last Thursday. The Patriots won the match in three straight sets. 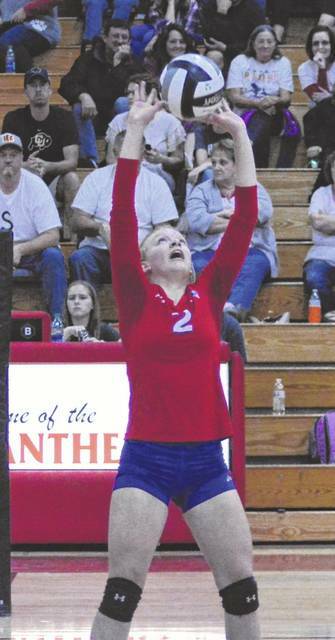 Tri-Village’s Lucie Morris sets the ball up for a teammate during a match at the Panthers home last Thursday. The Patriots won the match in three straight sets. 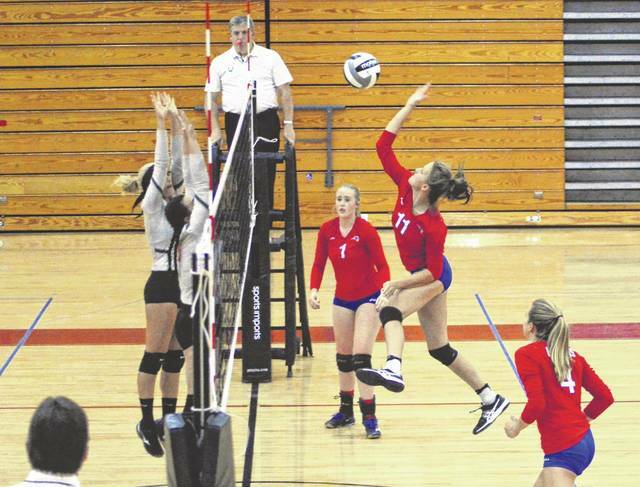 WEST ALEXANDRIA – A crippled Patriots volleyball team is limping into the last week of the regular season. The injury bug has hit the team hard – they are two starters down just before tournament time. So they are having to use fresh faces on the varsity squad as the team pushes to the finish line of the regular season. Against a .500 Twin Valley South Panthers team on Thursday, the patchwork lineup still managed to spoil the Senior night in three sets. The last set was a struggle, but still the team played well enough to pull out the win, 25-11, 25-19, 26-24. In the first set, the front line play was strong. 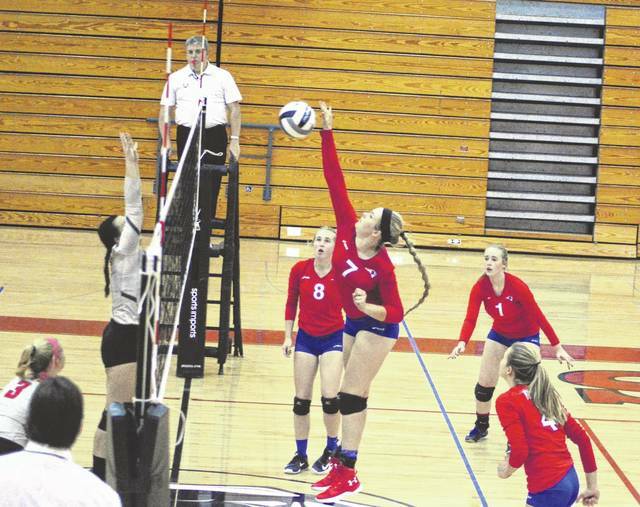 The Patriots had a height advantage and exploited it at the net. Meanwhile, the second row did a good job of digging and setting. South could not find an answer as it was not any one player that was scoring. Maddie Downing, Maria Petry, Abbi Lipps, Molly Scantland, Meghan Downing and Breann Lipps all had kills or blocks on the front line during the first set, so South could not focus on any one player. In the second set, South adjusted and did a better job of keeping pace. But Tri-Village had a couple of nice runs that made the difference. With Scantland serving, the team broke up a 5-5 tie. She got an ace and that set off a 6-0 run with her serving all the way. Breann Lipps had a couple of kills and the run ended with another service ace from Scantland. The team relaxed and South chipped away at that lead. It was 16-14 when the Patriots went on a second run (5-0 this time) that would grow the lead for good. The third set was not pretty if you were a Patriot fan. A resilient Panther team caught a second wind and kept fighting back. In the first part of the set, there were three ties. Finally, the Patriots woke up and pulled ahead. At one point they had an 8-point lead, 21-13. Just a few more points and it would be time to head home. But after a TVS timeout, a renewed Panthers team clawed their way back – finally tying the score at 24-all. Scantland got a kill and Maddie Downing got a block to score the last 2 points for the win and dash any TVS hopes for a fourth set. Assists: Abbi Lipps 14, Lucie Morris 10. Kills: Maddie Downing 9, Maria Petry and Breann Lipps 7 and Meghan Downing 5. Digs: Jayden Sharp 35, Breann Lipps 18, Abbi Lipps 10. Aces: Jayden Sharp 2, Molly Scantland 3. The team begins tournament play against Southeastern at 5 p.m. Wednesday at Covington. “We know that they are in a tough league. So despite their record, we expect a game from them. It is going to be a good, tough first round game for us,” Brewer said.